I tend to carry my books around with me, particularly if I’m going somewhere where waiting might be involved, like the Pizza place or the swimming pool. In the (considerable) time it took my to read this one, as I carried it around, a lot of people stopped me and wanted to talk to me about it. “Was it any good?” They wondered. “It’s big, isn’t it?” They remarked. “I started it but gave it up.” They confided. There seemed to be a lot of interest so I though it might be worth setting down a few thoughts about it here. But, before I do, a little scene-setting. Stephen King has been with me all the way. He has been a friend and constant companion in my reading-life. I started off by reading 'The Shining' in 1978, when I was 15, and I haven’t ever stopped since. I’ve read everything he’s ever written and I feel that some elements of the way he writes have inevitably rubbed off on the way I write. 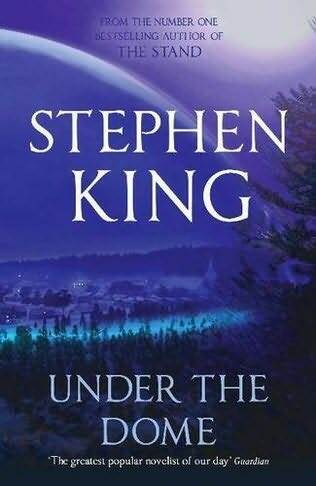 I do not always particularly adore the books Stephen King writes but some of them, particularly in the earlier years seemed to come along and speak some Technicolor Truths to me. I started reading ‘Christine’, for example, as soon as it appeared. I’ve have never re-read it and would probably find it a little ‘teenage’ and ‘obvious’ for my adult taste. But those heady days of reading it, crisp and new, were like being addressed directly to my soul. Not so much about haunted cars or revenge but rather about alienation and how very hard it can be to be a teenager. One of my favorites, now, is ‘The Girl Who Loved Tom Gordon.’ If you’ve never read King and want to see what he can do, try that one first. My own feelings about his writing seem to be at variance with that of the majority of his fans. While they ooze over the huge novels like ‘The Stand’ or ‘It’, I always feel that Stephen is at his most masterful in the short form, sparsely populated, novel. I would take ‘Misery’ or even the neglected ‘Gerald’s Game’ over any of those bigger tomes, any day. 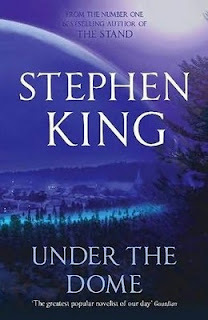 Which brings me to ‘Under The Dome’, one of the very largest of the Stephen King books. I asked for it as a Christmas Present and started into it soon after. It took a long time to read. At first glance, the story is the same as that in 'The Simpson’s Movie' wherein a huge dome comes down and traps a small town and its residents inside. Worry not, though, it’s not much like that at all and, fairly soon, any thoughts of Homer and his Spider Pig are left well and truly behind. The story is much more like a magnified version of King’s story 'The Mist,' where a group of small town residents get trapped in a local supermarket during a terrifying ordeal. Yes, it’s very like that, if you need a comparison. I won’t synopsise the story or run through the vast array of characters therein. You can get all that stuff elsewhere and done much better too. This is just my impression. I was engaged with the book throughout. The very size of it promises an immersive experience and it delivered that. The timeline in the book is short and the pace of unfolding events is rapid. In short it fairly rolls along. Downside? Well, for me, as with most of King’s larger works, the drawing on such a large canvas means that the paint is spread rather thin in places. For all the words and pages, I never felt I was getting to know any of the characters terribly well. They started out a little limited in depth and continued that way throughout. Also the effective ‘locking down’ of a key character for the mid section of the narrative seemed to make that part of the story less successful. One would fear that the train would run out of steam before the end but that is the redeeming factor in this book. Stephen has plenty left in the pot to take us positively barrelling over the finish line. A number of expected plot conventions are bucked along the way so that you’re never really sure how anything might turn out. As in all Stephen King novels, nobody is safe in here. And the ending. Not giving anything away but I thought the ending – the explanation – was humane and thoughtful and apt and this alone rounded the whole package up into a story that I am glad I took the time to read. Can I recommend this book to you? Well that really depends on who you are. If you loved the bigger King books of old, chances are you will love this too. If you enjoyed The Mist, you will find things in here for you. But if you are new to King and want to see what all the fuss is about? Perhaps you should go back up the road a little… and work your way up to this one. I love Stephen King as well. Thanks for the review. I love Stephen King now, but when I was a kid I'd heard about Carrie and steered clear of him LOL. So I 'discovered' him quite by accident, finding Eyes of the Dragon at the library, liking its cover and premise, and when I was finished I thought I just had to find more by that author, so finally checked the cover - ACK! Stephen King? So I enjoy his writing, and have read about ten or fifteen titles of his, but I find him a bit overwhelming -- he's just *too* good at horror and suspense and surprising twists, for me. Meh. As much as I actually did enjoy 'The Stand' I have no inclination to read this at all. You have however inspired me to rewatch 'The Simpsons Movie' - so thanks for that. CHEERS! I don't actually think I've read any King at all but he interests me. If I was going to read something it would probably be one like Dolores Claiborne because I enjoyed the film; Misery too for the same reason. But I'm not fond of huge tomes by any author. Give me a novella any day. The last one I read was 77 pages long. Now that is my kind of book. I like King but then I have "girl moments" where I don't need to know what the contents of someone's stomach looked like. But I've learned how to see those coming and can skip over the appropriate number of sentences without losing the story. I'll add this one to my list..thanks! I read his early books but fell out of interest when they all started to feel like I was reading the same book over and over again. I think Carrie had the most real passion for me. Cujo probably scared me the most - before I even read it (actually I almost decided not to read it cause I already have a thing about dogs). He wrote some book about a woman being raped (I totally forget anything more about that now) it was at that point that he jumped the shark for me and I have not read a single word from him since then. Have you ever read "The Lovely Bones"? I'd be interested to hear your review of that one. (Not the movie). Ken - have you read his book 'On Writing' - it is an oldie and an excellent read. Nice review, thanks for sharing. I second the praise for "On Writing". It is well worth your time. Susan: Some of the bigger ones are not that good, I still think. Canucklehead: Good luck with Spiderpig. Jim: I would commend 'The Girl Who Loved Tom Gordon' to you. Short and edgy - a bit dodgy in the end but good. Oyvind: Hi mate! I reckon that one alone will have got you through the Easter... and beyond. Laura: Someone just returned mu old old copy of Lovely Bones and I reread it about a month ago - haven't seen the film. I think the first chapter remains one of the most striking in modern American literature but, although I remember liking the remainder the first time, this time I found it a little unfocused and overly-sentimental. WiseMona/Poetikat: I don't know where my copy has got to but yes, it is a tremendous book - wise, shockingly honest and very inspirational. I'll be number three to recommend it. I read a lot of King up through my college years but lost interest. I think one of my favorites was Thinner. (?) The ending was, uh, bitter sweet? As for the comment on The Lovely Bones, I thought is was an amazing book. The subject matter was horrific, yet the story was compelling. I skipped the movie because the trailer looked very different. Sorry to get off topic!